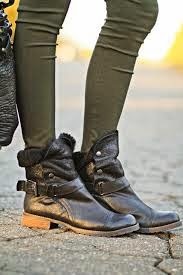 I've been searching madly for a pair of chic black flat boots that wouldn't kill my feet while working all day but that are still super cool. And warm. If last season's polar vortex taught me anything, it was that my Uggs were a valuable investment that have held out for 10 years. And that they are the ONLY warm pair of shoes I own, What they are not, however, is sleek. I feel like a co-ed wearing them all the time. What I landed on was Matt Berson's Tundra boots. Leather, shearling, chunky and slouchy but not too much so. If they're good enough for Olivia Palermo, (a girl who's got more money than she knows what to do with and still keeps coming back to these) they're good enough for me.